New ListingDisneyland Spiderman Luggage/ School Bag Trolley-sale! Official Ferrari Folding Push Trolley Bag Scooter for boys and girls. 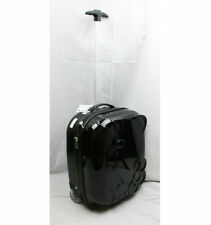 Hello Kitty Hard Shell ABS Trolley Carry On Luggage/Suitcase. Smooth to the touch. Handle on top for easy pick up. Has minor scratches and a little pink on Mickey. The toddler luggage set with hard shell protection and light weight is perfect as hand luggage on airlines, for weekends away or sleep-over. This luggage set are perfect for a trip with children. Size of 19" trolley case: 19" x 14" x 9.5". 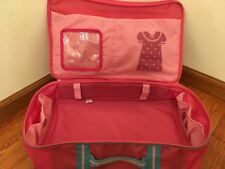 Jojo Siwa Travel Set. and a 88-page Jojo Activity Book. Great for Christmas Gift! Add more Jojo stuff! Rolling Suicase with extendable handle. Great for traveling in the car or airplane. Designed Especially for Kids. In creating a 'High-end' series for Disney, our designers incorporated several children-specific features. Smooth rolling wheels, so any child can easily wheel these fun cases around. Exterior Approx. It's crafted with Polyester. Polyester; lining: polyester. Material: Polyester. ZÜCA has been on a roll since 2004, making lives better—and making people smile—with our patented, super-durable and versatile, fashionable carry-all bags. We have revolutionized how people transport their belongings by helping them get around in a healthy way. Kids' Carry on luggage. Carry handle and adjustable pull handle for parents and kids. Designed by kids for kids. Easy Roll integrated wheels. Carry on approved. Also available in a set. You have our promise. Storage pocket inside the case. Wildkins blue HEROS rolling luggage. Luggage Style: Rolling. Bag Shell Type: Softside shell. Sanrio Hello Kitty Hard Shell Girls Kids Rolling Overnight Bag Luggage Suitcase. Condition is Pre-owned. Shipped with USPS Priority Mail. Skylanders Trap Team Poly carbonate Giants Hard shell Retractable Handle 4-Spinner Wheels Luggage Case. Your child will sure to love it to carry. Skylanders Trap Team Luggage Case. 18 (L) x 12 (W) x 9 (D). Red and blue with Pixar scene. Speed-I am Speed. Carry handle. Durable Molded Hard Case. HEYS DISNEY MICKEY. RIGHT KIDS ROLLING. LUGGAGE CASE. MOUSE 18" HARD UP. ADJUSTABLE HANDLE. CARRY ON WITH. Putting a scooter and luggage together, our improved version of our old scootie model is better than ever. Making travel fun for the whole family! Total Weight 9.2 lbs. Unique Like You! We won’t be Beat! Very good condition besides some stains that need to be cleaned. Excellent functioning condition. Zinc Flyte Kids. Luggage Scooter. 25 Liter Capacity. This luggage is to youth travel that the balance bike was to learning to ride a bike. THE perfect luggage for your little one to make them independent and. American Tourister Disney 18" Softside Upright luggage in cars Perfect for Disney Cruise • Printed polyester with vinyl front • In-line skate wheels for easy mobility • Zip-away, locking pull-handle • Easy-grip zipper pullers ideal for little fingers • Large interior features a mesh pocket and compression straps • Co-branded American Toursiter Carry-On size and weight allowances vary by airline. Go to AIRLINE BAGGAGE ALLOWANCES for more details. If the bag is overstuffed, it may not be accepted by the airlines. Body Dimensions: 18.0" x 12.0" x 7.0" Overall Dimensions: 19.0" x 12.0" x 7.0"
There is also a zipper closure that opens to reveal a roomy interior that holds everything they'll need. I apologize if this is inconvenient but the distributor does not allow cancellations or changes. Heys Parrot Travel Lightweight 1pc. Kids Luggage 18 inches x 13.5 inches . Now kids can travel comfortably and enjoy carrying their own baggage. Fun for the kids and a pleasure for the adult traveling with the child. The Luggage set is made of Poly carbonate and is a Hard-case but super lightweight. His favorite scarers are ready to travel and join him on exotic adventures with a Disney travel upright. rear wheels. zip closure with 2 pulls. retractable handle. Little boys will love going on an adventure with this Cars pilot case. Your child's favorite movie characters can now go everywhere with him/her and it is sure to bring a smile to that precious face you love so much!